Georgina MacDonald born 29 October 1822, Dingwall. Elizabeth MacDonald, born 25 Jul 1824, Dingwall. 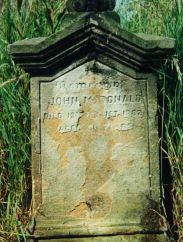 John MacDonald, born 29 Mar 1826, Dingwall. Margaret MacDonald, born 6 Jan 1829, Dingwall. Robert MacDonald, born 16 Aug 1831, Arnisdale, Glenelg. 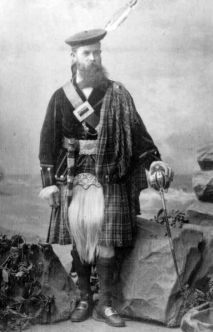 Kenneth MacDonald was born on 1 Feb 1834 in Dingwall. A son born dead in 1837, Inverness. Henry Ebenezer MacDonald, born on 23 Apr 1846, Muirtown St, Inverness. For the census of 1841 Georgina was recorded in the household of her future husband John McLennan and what I would guess was John's older sister Janet. 1841 Census (7th June) Inverness (98) Folio 7, Book 7, Page 16. Two and a half years after this census, on 5 January 1844 in Inverness, Georgina married John MacLennan. John was recorded as a potato merchant, and from his age and place of birth in future census records, John was born circa 1821 in Beauly\Kilmorack, Inverness. Alexander MacLennan was born on 13 Apr 1845. He died on 6 Dec 1892. Alexander firstly married Eliza Mar 1872 in Hackney, London. Alexander secondly married Jessie Anne Gardner in 1877 in Kinning Park. Eliza MacLennan was born in 1850 in Inverness. Eliza married Charles Stone . A Son Died In Infancy MacLennan . John MacLennan was born on 11 Aug 1855 in Edwards Crt Inverness. Margaret Georgina MacLennan was born on 12 Nov 1857 in Edward Crt Inverness. Margaret married William MacLeod on 29 Aug 1878. For the census of 1851 Georgina is recorded along with her family at 47 Petty Street, Inverness. Her husband John is recorded simply as a "merchant"
For the census of 1861 Georgina is recorded along with her family at 2 Edwards Square (Court? ), Inverness. Her husband John is recorded as a "potato merchant"
For the census of 1871 Georgina is recorded still at Edwards Square with her family. Her husband John is recorded as a "potato dealer"
..........whilst her husband John, still a "potato merchant" is recorded still in Inverness at 14 Market Brae, Inverness. For the census of 1891 once again Georgina and her husband John were recorded in households many miles apart. Georgina MacDonald was living with her son Robert Walton on the Hill, Lancashire. .... whilst husband John is recorded living with his married daughter, Margaret Georgina, in Glasgow. Georgina MacDonald died on 7 Sep 1892 in Fazakerley, Liverpool whilst living there with her son Robert and his family. She was also buried there. John MacLennan died on 14 Oct 1892 in St James Rd., Glasgow whilst living there with his youngest daughter Margaret Georgina MacLeod, nee MacLennan..
Elizabeth MacDonald was born on 25 Jul 1824 in Dingwall..
28 West Hozier Street, Partick, Glasgow. Inscription on MacDonald headstone in Craigton Cemetry, Glasgow. Lair No. 2983X - Very overgrown!! NOTE - This Lair was owned by John 's brother, Alexander MacDonald. Alexander MacDonald, died 3rd April 1906. For transcripts of letters (1875 - 1893) from Margaret to her brother Roderick in Australia - see Appendix M.
Margaret never married. For the census of 1871 she was working in Glasgow for a Mr Methven, an accountant. This is referred to in a letter of 23rd November 1871from her father Robert to his son Roderick in Australia. "Margaret is in the same place No. 30 Kelvinhaugh Street. ## Her master is very wealthy & made his Will, & he was very unwell, & watched by Maggie & her Mistress time about. He was not married & the Mrs is a friend of his own as House keeper. He is to leave thousands & she got £10 put in the Will for Maggie." Robert married Louisa Geddes on 15 August 1858, St. Giles, Middlesex. Harry MacDonald was born in 1858 in Dover, Kent. Harry married Emma Snow on 22 Jan 1887 in Camberwell, London. Emma was born about 1867 in Walworth. Elizabeth MacDonald was born in 1859 in Islington, Middlesex. Elizabeth married Charles Edwin Earwicker on 29 Jan 1888 in Wood Green, Edmonton, London. Charles was born about 1863 in Peckham, London. He died on 12 Dec 1927 in Westminster, London. Louisa MacDonald was born in 1861 in Islington, Middlesex. Robert MacDonald was born in 1863 in Islington, Middlesex. Robert married Ada Maud Hunt on 14 May 1902 in London. Ada was born in 1879. Alexander J. MacDonald was born in 1866 in Hammersmith, Middlesex. Alexander married Mary Jane Brook on 27 Apr 1890 in Wood Green, Edmonton, London. Georgina MacDonald was born in 1869 in Peckham, Surrey. Georgina married William Hall on 5 Feb 1896 in Bethnall Green, Middlesex. Roderick MacDonald was born in 1873 in Peckham, Surrey. Roderick married Florence E. C. Benwell daughter of George Benwell and Hannah ?????? on 1 Oct 1898 in Brockley, London. Florence was born about 1875 in Woolwich, Kent. For the census of 1871 Robert and his family were living in London in Albert Grove, Peckham. For the census of 1881 Robert and his family were still in Peckham, but now recorded at 27 Chadwick Road. 1881 Census (4th April) Peckham, Camberwell, London RG11/680 Folio 58 Book 2. Page 49. 27 Chadwick Road, Peckham, London. Robert MacDonald died seven or eight weeks after this census on 25 May 1881 in Peckham, London. For the census of 1901 the widowed Louisa was living "on her own means" along with her daughter Louisa and son Robert at 3 Wendover Villas, Woodgreen, Tottenham, London. 3 Wendover Villas, (Terrick Road? ), Woodgreen, Tottenham, London. For the census of 1911 Louisa was still living along with her daughter Louisa at 15 Beckford Road, Croydon. The whereabouts of her son Robert cannot yet be established. Louisa almost certainly died some time between April and June the year after this census as the is an entry in the index for Croydon (2a 385) for that quarter of the death of a Louisa McDonald aged 79. Kenneth died in infancy on 31 May 1835 in Dingwall. From the children details supplied by Robert MacDonald in a letter to his brother Alexander in Canada dated Inverness 24th April,1847. For transcripts of letters (1868 - 1905) from Alexander to his brother Roderick in Australia - see Appendix N.
Alexander worked as a shipwright both on land and onboard ship. Alexander married Rebecca MacKenzie daughter of Ewen (Hugh) MacKenzie a crofter and Catherine Boyd on 28 Jan 1896 in Pollokshaws Rd. GlasgowAlexander and Rebecca had no children. 4 Millar Street, Partick, Glasgow. Alexander died on 3 Apr 1906 in 4 Miller St, Partick. Rebecca died on 11 May 1906 76 Dumbarton Road, Glasgow. For transcript of a diary kept by Roderick (1851 - 1881) - see Appendix E.
Roderick married Joanna Urquhart on 13 Feb 1873 in Australia. Anna Munro MacDonald was born 17 Jan 1874 in Australia. She died 22 Mar 1874. Robert Henry MacDonald was born 7 Mar 1875 in Australia. After being an articled pupil of Richard B. Whittaker, M.S.A.. Melbourne he came to Canada in 1895 commencing here as junior draughtsman with Robert Findlay. In 1900 he travelled to Great Britain and Europe. Robert married Mary Rutherford on 23 Sep 1904 in Australia. Robert and Mary had one known child, Roderick Douglas MacDonald. He had positions with George B. Post and Sons, New York, and afterward became senior draughtsman with Crichton and McKay in Wellington, New Zealand. He was head draughtsman with W. W. Bosworth, New York, 1906 and 1907, and was associated with Ross and MacFarlane, Montreal, 1907 to 1912, afterwards entering partnership of Ross and Macdonald in 1913. As partner, Mr. Macdonald designed such outstanding buildings as the Royal York Hotel, Toronto; Mount Royal Hotel, Montreal: Hotel Saskatchewan, Regina;. Fort Garry Hotel, Winnipeg; Macdonald Hotel, Edmonton; Dominion Square Building, Montreal; Chateau Apartments, Montreal; Union Station, Toronto, in association with Hugh G. Jones and John. M. Lyle; Royal Bank Building, Toronto; Maple Leaf Gardens, Toronto; T. Eaton, Company Stores, Toronto and Montreal, Calgary and Saskatoon: YMCA buildings, Montreal, and Kitchener; Biological and Neurological Institute, McGi11 University, Montreal; Homeopathic Hospital, Montreal; rebuilding of the city of Halifax following the disaster of 1917, and several office buildings in Montreal and elsewhere. Mr. Macdonald was a Fellow of The Royal Institute of British Architects, Fellow of The Royal Architectural Institute of Canada, a past president and recipient of Medal of Merit of the Province of Quebec Association of Architects. Robert died 16 Dec 1942 in Montreal. This information is from one of two obituaries from unnamed Montreal Newspapers - For transcripts see Appendix K.
Mary Ann MacDonald was born 3 Jan 1877 in Australia. She died Jul 1936. John Urquhart MacDonald was born 29 Aug 1878 in Australia. He died 6 Mar 1956. John married Robina Crosbie. John and Robina had at least seven children; Alison Mary MacDonald, Donald Urquhart MacDonald, Roderick William MacDonald, Beth Crosbie MacDonald, Flora Maitland MacDonald, Robina Margaret MacDonald, Jean Wallace MacDonald. Margaret Elizabeth MacDonald (Roderick) was born 26 May 1880 in Australia. She died 29 Mar 1949. Margaret married John R. Nichol. They had the following children; Ian McDonald Nichol, Jessie Urquhart Nichol, Margaret Elizabeth Nichol, Robert Alexander Nichol, Roderick Fraser Nichol, Ronald Stewart Nichol. Roderick Alexander MacDonald was born 28 Oct 1883 in Australia. He died 19 Oct 1971. Roderick married Muriel Jean Cook. Muriel was born 12 Aug 1888 in Australia. She died 12 Oct 1940. 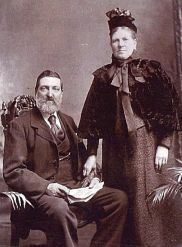 Roderick and Muriel had five known children; Roderick Ian MacDonald, Robert Stewart MacDonald, John Alexander MacDonald, Thomas Kenneth MacDonald. James Gibb MacDonald was born 13 Oct 1885 in Australia. He died 10 Jun 1941. James married Jean Haworth. James and Jean had two known children; Frank Robert MacDonald, John Neil MacDonald. Olive Estella MacDonald was born 23 Nov 1890 in Australia. She died 13 Mar 1960. Olive married Cuthbert V. Bridgway. Roderick died on 11 Oct 1915 in Australia. Joanna died on 27 Oct 1924 in Australia. Katherine died of measles on 4 Apr 1847 in Inverness. She was buried on 6 Apr 1847 in Inverness Old High Church Burying Ground. For transcripts of letters (1868 - 1908) from Henry to his brother Roderick in Australia - see Appendix F.
Henry married Annie Maria Steiness daughter of Edmund Steiness on 20 Apr 1870 in Galveston, Texas. Annie was born on 23 Mar 1851 in Galveston, Texas. Emilly MacDonald was born on 23 Jan 1871 in Galveston, Texas. She died on 12 May 1872 in Galveston, Texas. Roderick MacDonald was born on 11 Feb 1875 in Houston, Texas. He died on 13 Oct 1879 in Houston, Texas. Georgiana MacDonald was born on 18 Feb 1880. Georgina firstly married Henry Broecker . Georgiana secondly married George Newlen. Alexander Louis MacDonald was born on 14 Nov 1883. Alexander married Isora Cordelia Franssen . Henry MacDonald - Head. Born Feb 1848, aged 52. Married for 30 years. Born in Scotland of a Scottish father and a Scottish mother. Occupation - machinist. Anne MacDonald - Wife. Born Mar 1851, aged 49. Married for 30 years. 4 children - 2 living. Born in Texas of a German father and a German mother. Georgina Broker - Daughter. Born Feb 1880, aged 20. Married for 2 years. 1 child - 1 living. Born in Texas of a Scottish father and a Texan mother. Louis A. MacDonald - Son. Born Nov 1883, aged 16. Born in Texas of a Scottish father and a Texan mother. John H. Broker - Son-in-law. Born Jun 1879, aged 22. Married for 2 years. Born in Texas. George Broker - Grandson. Born Jan 1899, aged 1. Born in Texas of a Texan father and a Texan mother.